I teach three periods of English II. To increase community, I did NOT create three separate classes in Schoology. As you can see below, I created one big class! When you have loaded all of your students into one big class, the next thing you want to do is add students to grading groups by period! So while I have all 74 kids in one giant class, I can also work with them by period. So what are some of the benefits? and important! Just because students aren’t in the same class doesn’t mean they shouldn’t be able to interact or work together! Working with someone who is not in the same building as you is a 21st century, real-world skill that students need to develop. Grouping all of your students together in one big class lets them develop this skill. Sometimes, I will even group a student with a student who isn’t in their class. They must complete an assignment asynchronously with a peer that they won’t physically see. That’s taking collaboration to the next level: the real-world level. One big class is great for me as well. I only have to do things once on Schoology. I don’t have to copy work or updates to more than one class. I don’t waste time flipping to each and every class and checking separate classes discussions and assignments or posting updates. I was talking to a teacher who had nine periods! Nine! He made nine separate classes in Schoology even though it was the same subject! I asked him how much time he wasted flipping from class-to-class checking discussions and how often he forgets which classes he has checked and which ones he hasn’t. He just sent back a frowny face. Remember when I said this year I assign students a partner to work with that wasn’t in their class? I did that last year too, but I assigned a higher-level student with a lower-level student. Additionally, you’d be surprised at how the quality of a low-level student’s contributions to the community increases when they see the good quality contributions being modeled by honors students. Moreover, passion is contagious. The passion of some of your students will rub off on others. Also, in my experience, I’ve always found my low-level students were motivated when I told them they were being grouped with honors kids and being treated as equals. Especially after my beginning-of-the-year speech where I tell my low-level students, “You were put here by mistake! This is the year we show them!” I was always impressed with how many students took that message to heart and tried to prove me right. One big class —-> Grading Groups by period —-> Grading Groups by Guild —-> the individual student. I am able to reach my students on different levels and differentiate their instruction at every stop along the way. Even though students are different, setting up your LMS this way allows everyone to learn together while still getting the individual instruction that they need all while making my life easier. If that is not the definition of a win-win, I don’t know what is. Man, do I love #edtech! 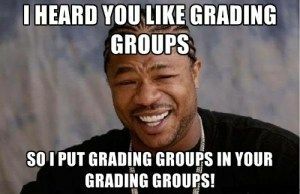 So try creating one big class in your LMS and then breaking them into Grading Groups from there. I think you will be pleasantly surprised! Chris Aviles teaches English at Barnegat High School in New Jersey. He presents on education topics including gamification, technology integration, BYOD, blended learning, and the flipped classroom. Read more at Teched Up Teacher.